Gerald Hewitson, a Quaker based in Wales, is set to deliver the 2013 Swarthmore Lecture, A Journey to the Heart of the Quaker Experience. The lecture will be given during Britain Yearly Meeting at Friends House on 25/05/2013. Although the lecture will be delivered then, the Swarthmore Lecture is in the care of the Woodbrooke Quaker Study Centre. A former clerk of Quaker Life, Gerald will use the lecture to explore his personal journey as a Quaker as well as the spiritual experiences of his life. In 04/2012 Gerald addressed the Quaker Life Representative Council in ministry about his own experience of deepening his spiritual life through prayerful practice and finding his way to the gathered centre: “everything else is just words,” he said. 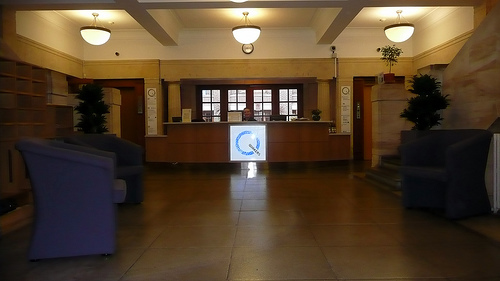 You can hear Gerald’s ministry on the Woodbrooke Quaker Study Centre website. Gerald is a former headmaster and one of the founders of Holyhead Quaker Meeting in Anglesey. In 2012 he and his wife Gwyneth served as Pendle Hill College in Pennsylvania in 2011-12. They have also lived in Turkey. Gerald is a practitioner of Experiment in Light, a meditation practice based on early Friends’ discoveries. From 5 to 7/07/2013 Gerald and Simon Best will deliver a course at Woodbrooke Quaker Study Centre. Journey to the Heartland of the Quaker Experience: a practical follow-up to the 2013 Swarthmore Lecture will explore the profound sense of calling Friends have known and examine early Friends’ experience of transformation. The core focus will be practical spirituality – considering what we can do to prepare for and be open to the possibility of transformation. The Swarthmore lecture will be delivered on Saturday 25/05/2013 at 7pm. The lecture is open to the public and will be delivered at Friends House, 173 Euston Road, London NW1 2BJ. I look forward to this lecture very much since I have an abiding interest in the ‘Kingdom of God’ or what may be called these days the ‘Covenant of Peace’ (to use a Foxian term) or, say, the ‘Rule of Love’. In my book, “The Early Quakers and the ‘Kingdom of God'” (Inner Light Books, 2012) which is available in our Quaker Bookstore and online, I mention 40 alternative names. The ‘Kingdom’ was the central core of the first Friends as it was for Jesus, their inspiration. It was mentioned in over 90% of their tracts in the period 1652-63 and remained vital to the Quaker way especially up to 1700 and beyond. It maintains its dynamic today, but few Friends realise it. many show an antipathy towards it for all sorts of reasons. But it forms the basis of our Testimonies, for instance. Without the ‘Kingdom’ there is no Quakwerism. Interestingly, the 1650s experience of the ‘Kingdom’, and its Lamb’s War was the actual peace testimony, not the document presented to Charles 11. This, along with other documents advocating spiritual warfare such as that written by Fell in 1660 and Burrough in Dec. 1659, should be seen as a tapestry of the true peace testimony, the 1650s experience of the ‘Kingdom’. It’s an exciting topic and the ‘Kingdom’ and its orthopraxis is really the common language we Quakers crave. It is the unifying principle for all Friends of whatever persuasion (see my article in “Quaker Religious Thought”, No. 13). In time I pray that an ever-wider appreciation of the ‘Kingdom’ among Friends will eradicate the need for the demarcations that exist within the Quaker world. I am at present finishing off a short work that brings the Way, the ‘Kingdom’, very much into the present. It should be available soon. I’ve provisionally entitled it “The Revolutuionary Way of Jesus”. It is for Friends and non-Friends alike.